The Cape Hatteras Lighthouse, located on the Outer Banks of North Carolina, is world-famous. It is not just the tallest brick lighthouse in the world… but years ago when it was relocated farther away from the coast to save it from beach erosion, it became the tallest brick structure of any kind in history to be moved! Visit the Outer Banks Web site to read more about this famous lighthouse. Regular followers of my blog might feel a sense of deja vu, because in some ways this resembles the bell tower that I posted earlier this week. It was, in fact, while I was drawing that illustration that I got the idea to draw this one. They really aren’t all that similar though, other than being tall slender buildings, but I had a sense of deja vu as well. As always, please let me know what you think of this one. I’m quite happy with how it turned out, especially with the mostly grey tones and the splash of red in the base of the lighthouse. Remember, if you are interested in requesting my services as a Technical Illustrator, please use the Contact page and provide me with as much information as you can about your request. 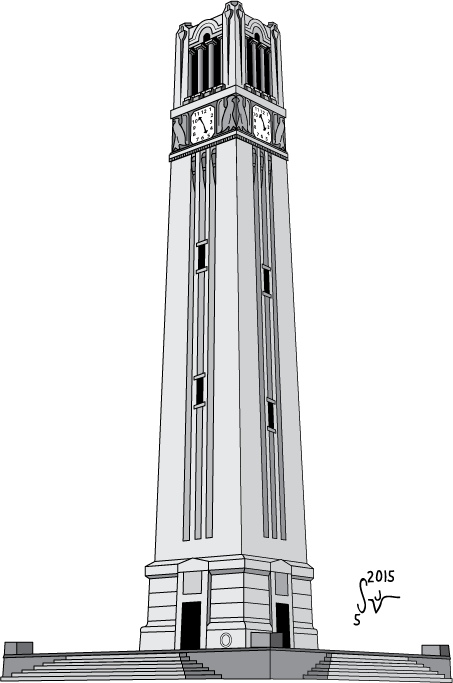 This is an illustration of the North Carolina State University (NCSU) Memorial Bell Tower. It is located on campus in downtown Raleigh, NC. Click the link in the previous sentence if you want to read more about the history behind this tower. 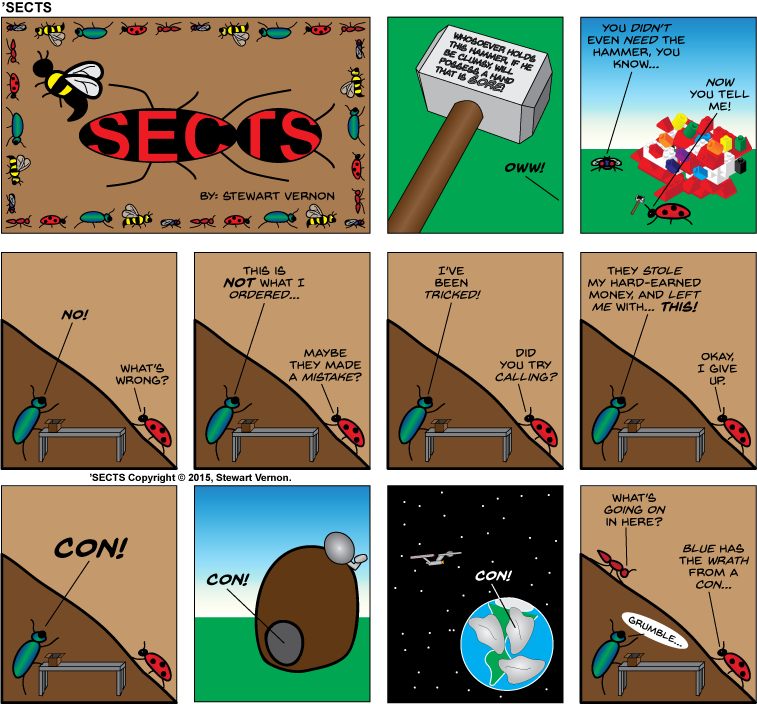 I wish that I could have posted this on Memorial Day, but it took me longer to complete than I originally thought. I was still working on this yesterday into the evening. Please let me know what you think. As to the question of “for whom the Bell Tower was drawn?” It was drawn by me, for me, and is now part of my blog. 🙂 My apologies to Ernest Hemingway. Remember, if you are interested in requesting my services as a Technical Illustrator, please use the Contact page and provide me with as much information as you can about your request. See if you can follow this… Many years ago we had the Charlotte Hornets, who moved to New Orleans… played a year in Oklahoma City after Hurricane Katrina, then became the New Orleans Pelicans this past season. Meanwhile, some years back we got the Charlotte Bobcats who finally became the Hornets again! 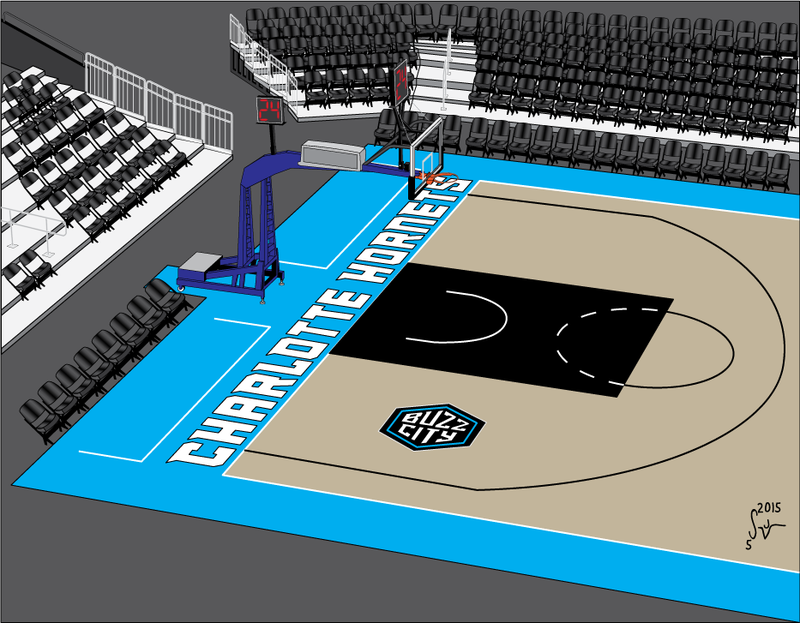 So… I’m a basketball fan, NBA and college… and not being in the playoffs didn’t stop me from deciding to make an illustration of the inside of the Charlotte Hornets Arena. About the only thing missing here is the honeycomb flooring, which I felt would have distracted from the rest of the illustration… oh, and the net. The net was going to be so small that I decided not to bother with it for this particular illustration. Let me know what you think! Remember, if you are interested in requesting my services as a Technical Illustrator, please use the Contact page and provide me with as much information as you can about your request.